I usually wake up an 1-1.5 hours before my lecture. It takes me 30-40 mins to get ready and have breakfast and then 20 mins to get to uni. I live in Falmouth and the bus stop is only 3 mins away from my house. The timetable is quite flexible this year, sometimes my lectures start at 9am and sometimes at 1pm. This Monday I had a 30 minute meeting with my course mates and lecturers at the local coffee shop – Koofi. The Business School always organises meetings and events for the whole course, so all students get to know each other better as well as become good friends with the professors. In the morning, we all met up, talked about what we’ve done during summer, had coffee and went to our first lecture. As I’m a Business student, every year I have to complete a work placement. In my first year, we had to work in the third sector organisations such as charities and social enterprises. In Year 2, we had a chance to work at any company and industry and this year we have to undertake a consultancy project, which means we have to consult a business of our choice. During this lecture, our Employability Advisor explained us how to approach a business and what are the benefits and disadvantages of the consultancy industry. After a two-hour lecture I had an hour break before my next lecture. Usually, when I have a long break between lectures I go to the canteen on campus, The Stannary, to have lunch. The canteen is improving every year. There are a lot of things to choose from: a selection of salads, soup of the day, sandwiches and 3 different variations of hot meals, for example, meat with potatoes, chicken curry with rice and pasta. Vegetarian options are also available. Next to the canteen, there is a sandwich bar, where you can make your own sandwich or get a salad or a soup as well as Starbucks coffee and desserts. Every day we also have a food truck outside the canteen, it is different every day, for example, one day we have a food track offering Indian food, another day Burgers, Falafel and a lot of other options. After lunch, I went to my second lecture of the day. In the second and third year, we can choose 2 optional modules, Small Business management is not compulsory, but since I am interested in entrepreneurship I decided to pick this module this year. At the beginning of the lecture our professor told us about her experience, then we talked about different types of entrepreneurship, she explained us the assignments and projects we have to complete and everyone in the classroom quickly presented their business ideas. After the lecture I had a meeting. 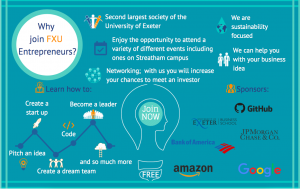 This year my friends and I have launched a new society on campus called FXU Entrepreneurs. 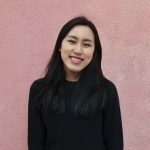 I am the Head of Marketing and my role requires managing social media for this society, communicating with the members and promoting events to encourage more students to participate in our events. There are only four of us in the committee, so we had a quick discussion about our future events, sponsorship and so on. When I finish my lectures and meetings, I usually go home. I love being active and love sports, so every year I join a new gym. In the first year I was also a part of the Volleyball society, but since I don’t live on campus anymore, I am not motivated to go to the training which are at the Sports Centre on campus twice per week. After I came back home from Uni, I decided to choose a new gym since I have just moved to Falmouth. As it was my first day at uni, I didn’t have much homework to do, but usually we have readings to do before every lecture. This time I had to prepare a minute long presentation about myself and about my business idea for the Small Business Management tutorial for next day. I usually have dinner around 6-7pm and if my flatmates are at home then we have dinner together. I live with 3 other people, which I think is perfect as it doesn’t feel like there are a lot of us in the flat. Sometimes we cook together but, usually, I make dinner just for myself, then we eat and chat in the living room. 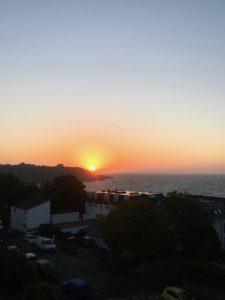 In the evening I went to my friend’s house to help them unpack since they just moved into a new house, which has probably the best view in Falmouth. Their house is located at the beach, so the view from their rooms is incredible. Evenings I usually spend with my friends – we go out for dinner or to the cinema, or just stay at the house; also if the weather is nice we go to the beach. 3-4 times per week I go to the gym in the evenings as well. 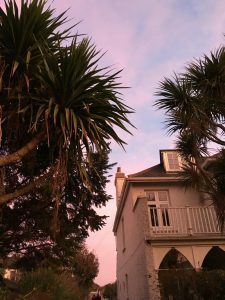 So every day is different but since it was my first day back in Falmouth, I just spent some time with my flatmates. Before going to sleep I usually prepare everything for tomorrow and plan my day. Since we have a lot of time for independent studies it is essential to organise yourself to be productive as much as possible. 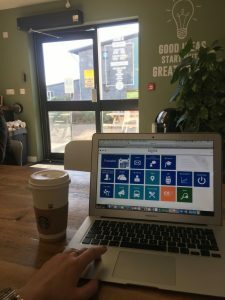 This is just a tiny part of my life as a Business student at the Exeter University, so I hope by reading this you can try and imagine what is the life on the Penryn Campus is like.